By booking a holiday for your tortoise with us, you have read and agreed to our terms and conditions. The word 'tortoise' refers to each and every tortoise that belongs to you, the customer, whenever the tortoise is in our custody. The word 'customer' refers to the owner of the tortoise only, with no exceptions, regardless of whether "Cosy Tortoises" are provided with someone else details as 'emergency contact details'. For your reference "Tortoises on Holiday" is the name of "Cosy Tortoises" tortoise boarding service. Hence whenever the company name "Cosy Tortoises" is referred to in these terms and conditions it is directlly referring to the "Tortoises on Holiday" tortoise boarding service presented on this website. 1. Full payment must be made at the beginning of your tortoise's holiday, unless you are using our collection and return service then payment must be made a week beforehand. 2. Should the "Cosy Tortoises" tortoise boarding service for any reason cancel your tortoise's holiday, "Cosy Tortoises" will not be liable for any costs whatsoever or be liable for compensation. 3. "Cosy Tortoises" tortoise boarding service will not accept any tortoise that is currently receiving medical treatment without prior agreement in writing. 4. Should "Cosy Tortoises" decide that your tortoise requires urgent medical treatement then "Cosy Tortoises" will take the tortoise to a specialist reptile veterinary surgeon. "Cosy Tortoises" tortoise boarding service will not be liable for charges incurred by consultation with the vet or any treatment administered. You the 'customer' will be liable for the full costs charged by the reptile vet. 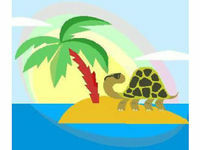 "Cosy Tortoises" will make every effort to contact the 'customer' before or during treatment. "Cosy Tortoises" will not be held liable if for any reason contact with the 'customer' was unsuccessful. 5. Should your tortoise become ill during its stay, "Cosy Tortoises" will transport your tortoise to a specialist reptile vet (approximately 50 miles away). You will be charged at 40p per mile from Gillingham in Dorset to the veterinary clinic and for the return journey at 40p per mile to Gillingham in Dorset regardless of whether or not the tortoise is with us on our return journey. 6. No treatment will be paid for by "Cosy Tortoises" at any time. 7. The customer gives permission for "Cosy Tortoises" to give your contact details to the vet. The customer's contact details are their name, address, contact telephone number and e-mail address (if provided). 8. The "Cosy Tortoises" tortoise boarding service will provide food, vitamins, water, UV lighting, shelter and heat according to the individual species requirements. The "Cosy Tortoises" tortoise boarding service will take all necessary security precautions to minise the risk from the following: theft, loss, fire, accident, deliberate sabotage, vandalism and extreme weather conditions. However "Cosy Tortoises" will not be liable for any reason, should any of the aforementioned events happen that result in injury, loss or death of your tortoise. If your tortoise is lost or stolen during our stay then the police will be contacted immediately. "Cosy Tortoises" will make every attempt to contact the customer as soon as possible. 9. You are stronglty recommended to provide insurance for your tortoises. The "Cosy Tortoises" tortoise boarding service can provide insurance for your tortoise however this will cost more and must be agreed in writing at least one week before the beginning of the holiday. 10. Should you fail to collect your tortoise on the agreed date, "Cosy Tortoises" will continue to charge at the daily rate specified for that species until the tortoise is collected. Full payment must be made on collection of the tortoise. 11. The "Cosy Tortoises" tortoise boarding service will not use any electrical equipment owned by the customer under any circumstances. You can bring you own food and/or water bowl if you wish. 12. The customer will be expected to sign a disclaimer acknowledging the fact that they agree to all of these terms and conditions prior to transferal of custody of the tortoise to the "Cosy Tortoises" tortoise boarding service. Copyright © 2018 Cosy Tortoises UK. All Rights Reserved.